A couple of days ago I inadvertently sliced my finger while unwrapping an Oster blender / food processor that I got for my birthday. (Damn! I should have looked at that YouTube unboxing video first!) It wasn't a huge slice but it was bleeding like a sonovabitch, so I hustled to the medicine cabinet for a BAND-AID® (registered trademark of Johnson & Johnson) and some kind of ointment. Sadly, the cabinet contained only a box of minimally sticky CVS bandages and no antiseptic ointment of any kind. With no real option, I decided to use a CVS bandage sans ointment. Then I spotted a little bottle hiding in the corner of the cabinet containing a substance that I had almost forgotten about, something that -- if you're under 30 -- you've probably never heard of. Its chemical name is "merbromin" but it was mass-marketed in the United States for the better part of a century under a different name: Mercurochrome. Opening the Oster blender box without assistance took courage, but what happened next was truly living dangerously. I unscrewed the top off of the bottle, removed the glass applicator and placed a daub of Mercurochrome on my cut finger. And there you have it. I have just admitted to self-medicating myself with a drug that has been banned in the United States of America. #politicalcareerover. At this point you're probably wondering why Mercurochrome is a banned substance. Well, there's a short answer and a long answer. The short answer is that it contains mercury, a substance identified by the EPA as a neurotoxin which, in sufficient quantities, is detrimental to your health. The long answer is much more interesting. After extensive research via that fake-news pipeline known as the Internet, I learned that, in 1889, a John Hopkins professor named Ira Remsen created a substance called phenolsulfonphthalein (as difficult to pronounce as it looks). In 1919, Hugh H. Young, another John Hopkins professor, built on that discovery to create merbromin, a related compound containing a trace amount of mercury. 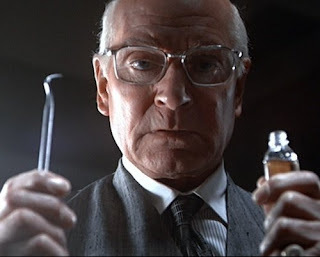 Finally, a third guy named Dr. H.A.B. Dunning developed a two percent solution of merbromin that would become known as Mercurochrome. 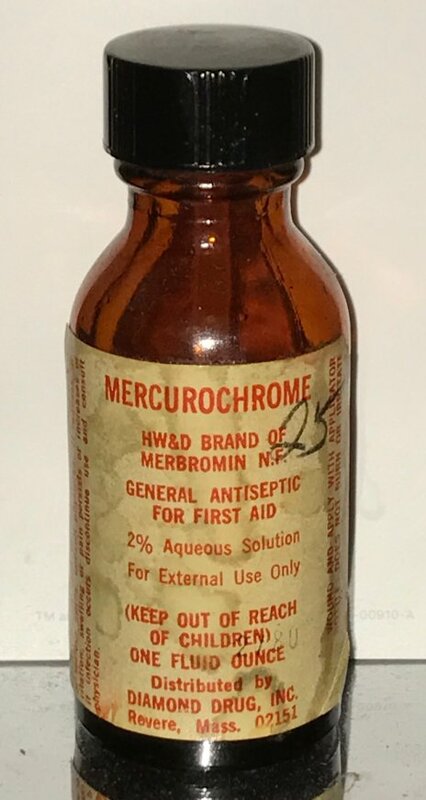 While initially used as a urinary antiseptic, Mercurochrome was soon sold to the public as an all-purpose antiseptic for small cuts and scratches. Its trace amount of mercury acted as a disinfectant, disrupting the metabolism of microorganisms that could infect an exposed wound. There were already many other non-mercury based antiseptics available to consumers. The patent on Mercurochrome had expired. If a company chose to invest the time and money and managed to persuade the FDA to approve Mercurochrome, any other company would then be able to produce a generic version. Mercurochrome was a very inexpensive drug to make with a very low profit margin. The public had become wary of anything that contained even a trace amount of mercury. "Generally speaking, methylmercury is the poisonous form which is not the form of mercury found in Mercurochrome, thermometers, dental fillings, electrical switches, or vaccines. Mercurochrome contains mercury in a disodium salt form which is considered to be perfectly safe." Despite it's impressively sounding name, ISPUB has all of the earmarks of a fake news site or, at bare minimum, a site without the proper amount of scientific oversight. 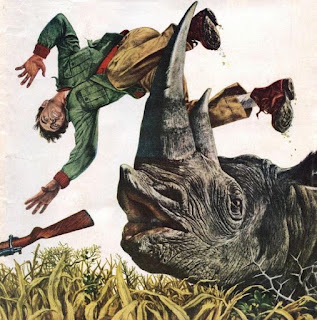 I resorted to quoting from it because, after 4 hours of searching the web, it was the only site I could find that even attempted to address the safety question. Every other site avoided the issue with variants of "If the FDA banned it, it must be dangerous!" or "Better safe than sorry!". While I understand those sentiments, there still should be some objective scientific evidence as to whether Mercurochrome is safe or not, especially since it is still being produced and used by other countries. But as far as I've been able to determine, the effect of Mercurochrome on humans has never been rigorously tested and documented. References to Mercurochrome describe it as a 2% aqueous solution of merbromin containing a "trace amount of mercury". Per FDA documents, a "trace amount" of mercury must be less than 1 part per million. The FDA has also set the maximum permissible safe level of mercury in seafood at 1 part per million. A drop of Mercurochrom (which is mostly water) weighs approximately 0.050 grams. A recommended serving size of swordfish is approximately 100 grams. Therefore, eating a meal consisting of a recommended serving size of swordfish will expose your body to 2,000 times the amount of mercury that is contained in a drop of Mercurochrome. Stated another way, you can put 2,000 drops of Mercurochrome on your body before it becomes a mercury health-hazard greater than a single FDA-approved swordfish dinner. PS: Mercurochrome remains banned in the United States, France, Germany and Switzerland.